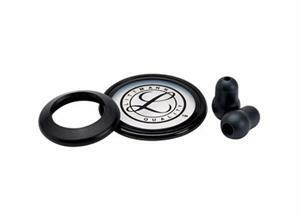 3M Littmann® Stethoscope Spare Parts Kit for the Classic II S.E. stethoscope contains a black rim and tunable diaphragm for the adult side of the chestpiece and a black non-chill rim for the bell side of the chestpiece. Also included are two small (1/2 inch), black Snap Tight Soft-Sealing Eartips. Tunable diaphragm technologya 3M inventionlets clinicians hear different frequency sounds by simply adjusting the pressure on the chestpiece. Hold the chestpiece with light pressure to hear low frequency sounds; press a little more to hear higher frequency sounds. This time-saving feature allows the healthcare provider to focus on the patient, while the non-chill diaphragm provides patient comfort.